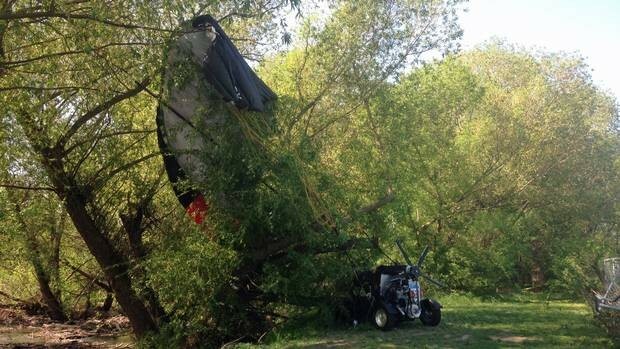 On May 10th, residents of Vernon in British Columbia saw a sight that was less Chitty Chitty and more Bang Bang as a flying car crashed through a fence and into a tree near an elementary school. The car's pilot and passenger, who were driving the experimental flying car called "Maverick," were taken to the hospital with minor injuries and have since been released. "It seemed there was an anomaly on our approach to landing," Ray Siebring said in a phone interview with The Canadian Press from the crash site. "It was just a sharp left turn that turned into a spiral, so the spiral took at least three rotations." The situation called for quick thinking. "I experienced one of those ... moments where time slows down," he said. "The training kicked in so that we were able to operate the aircraft and move it to a safe area. "We were able to stop the rotation, but our altitude was critically low. I gave full power to dampen the forced landing and directed the aircraft ... away from the school and into some woods." Unique from other flying cars that have been recently making headlines, the Maverick resembles a dune buggy with a parachute and giant fan attached to the back; it is produced by a company in Florida. While this particular flight did not end well, the company that produces the Maverick has in fact conducted a number of successful test flights. According to the manufacturer's website, the car can travel at speeds up to 160 kilometers per hour on land and up to 65 kilometers per hour in the air. It costs at least $94,000 to purchase, according to the site. Gord Molendyk, spokesperson for the RCMP who was at the scene, indicated that the machine had taken off from the airport in Vernon. "It looked like it was on its approach," Molendyk said. "There was motor sound and people looked up and it got into trouble and came through the fence and into the trees here." Dale Olsen, a teacher at the nearby Fulton Secondary School, and said it was the talk of the morning. "A lot of the kids saw it around school this morning," he said. "They said it looked like it stalled, the parachute started crumpling up and they couldn't get it going again. No one was hurt on the ground although children from the school were preparing take to the nearby grounds for a track and field day. The crash has not deterred Siebring from further developing the Maverick, who hopes one day the flying machine could be used for medvac missions and to ferry medical supplies from ships offshore to Third World Regions. "We look to learn some good lessons today and I'm one of the few pilots who actually gets to do that," he said. "I'm not scared off on the technology behind it; how would I say, not gun shy but very sober, we will take a sober look at every aspect of this flight."